The Glass Studio was established in 1982 by brothers Stephen & Thomas Smylie. 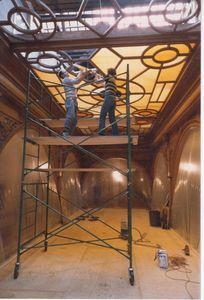 The incredible history and creative potential of the stained glass art form is why we became glass artists 37 years ago. Since the opening of our first studio in downtown Toronto we've designed and installed thousands of original stained glass windows . Visit the studio to see what we can do for you! Our showroom has examples of our work and there are thousands of images of completed commissions in our portfolios. Our art is commissioned for skylights, door panels, leaded windows, kitchen cabinet panels, room dividers, glass railings, decorative firescreens and wall art. Our work experience covers a broad design spectrum starting with late 1800's Victorian, the 'arts & crafts', 'art nouveau' and 'art deco' periods and our own contemporary work from 1982 to the present. 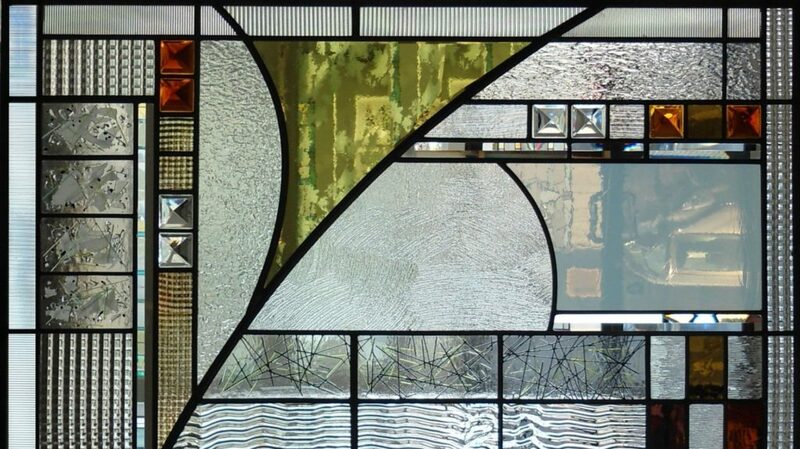 Seven of our portfolios are filled with photographs of our stained glass and leaded glass designs - ranging from colourless, purely textural pieces to exuberant contemporary installations. Bevelled glass adds sparkle and brilliance to any design, traditional or contemporary. We're proud of our ability to make our own custom, hand-bevelled glass on restored, circa-1920's Henry Lange beveling machinery. This gives us complete design freedom and distinguishes our work from the 'cookie-cutter' look of mass-produced bevel cluster sets. 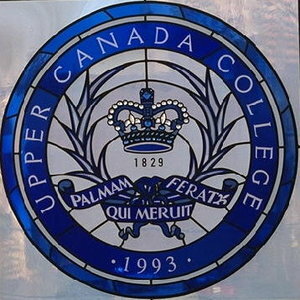 When you commission a bevelled window from The Glass Studio, you'll get a unique, original design because we don't use 'stock' bevel clusters. If you’ve ever observed that Victorian-era bevelled windows were more beautiful than today's commercial 'insert' products, we agree. The difference lies in the thickness of the glass used and the steepness of the bevel angle. The secret to making spectacular bevels is to use thick glass and then grind steep, hand-polished refractive angles. You'll see the difference immediately, in the quality of our work and designs that you won't find anywhere else. 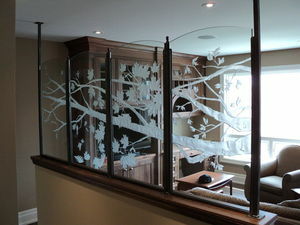 Read more about our custom bevelled glass. Our glass surface ‘etching’ or deep, sculptural carving is an excellent, practical alternative to leaded glass for many applications. Carved glass is ideal for complex, three-dimensional artworks or for subjects that are impractical to realize with the stained glass medium. Surface etched glass is perfect for simpler motifs and Victorian-era reproduction designs. Our sandblasted work is completely produced by hand - we don't use computers to draw, cut or carve artwork. Each piece is custom made and signed. We have three full portfolios dedicated to our sandblasted glass commissions. We undertake stained glass and leaded window repairs ranging from the simplest ‘one piece’ on-site residential repairs to large conservation and restoration projects. Noteworthy commercial clients include The Royal Ontario Museum, The Ontario Legislature and the City of Toronto. More than 3,300 residential clients have used our on-site leaded window repair service to date. We provide written quotes and prompt, professional on-site service. We also repair and restore bent-glass lampshades, antique carriage clock bevels and other glass objects. We like challenges, try us! We offer consulting and conservation services too. If you're renovating and want to avoid possible damage to a valuable stained glass window, you can have us remove it, store it and return it when you're ready. Your glass will be fully insured during transit, handling and storage.